Tell us about how you first discovered Vinnie. I first heard about her—or rather, read about her—in the pages of E.L. Doctorow's Ragtime. She had a brief scene with Harry Houdini, a major character in the book. She was feisty, even in that! Fast forward and I'm halfway through my next book for Random House, when I realize that I can't finish it. It just wasn't interesting to me, and of course—how can an author then expect the reader to be interested? But I knew that before I told my wonderful editor that I couldn't finish it, I needed to have a couple of preliminary chapters of something else. So I did what I always do—I spent long hours reading histories, timelines, Googling, anything that might spur my interest. This consists of looking through a lot of lists, too. I knew the era in which I wanted to write, and I also knew that this time I wanted to write an American story (since Alice was set in England). On one of these lists, the name "Lavinia Warren Stratton—AKA Mrs. Tom Thumb"—came up, and I remembered that scene in Ragtime. So I did a quick Google search of her name, and was immediately entranced by her story. As a child (and even now), are you a fan of the circus? Not really as a child, but yes, now I enjoy the pageantry. I am really interested in the performers, though—I always find myself wondering how they chose this life, and why, and what it's really like. What did you find most provocative about Vinnie's life as you researched the novel? What surprised you the most? What still resonates with you? Tell us a little about the research you did on Vinnie: where and what were your primary sources? The primary sources were her unedited, loosely-written autobiographical notes, which were compiled and published in 1979 by a man named A.H. Saxon. Also a book called "General Tom Thumb and his Lady," which is based mainly on their lives as advertised by P.T. Barnum—in other words, it's inaccurate, but important in understanding the myth of their public lives. Also, "Barnum Presents: General Tom Thumb" by Alice Curtis Desmond—again, largely a retelling of Barnum's version of their lives. And I read several biographies of Barnum himself. Also, Robert Bogdan's "Freak Show." But the most important research was Vinnie's own writings, in her loose autobiographical sketches. And the most provocative thing, to me, was what she left unsaid. This became the reason for me to write the book. Her voice is so relentlessly cheerful and optimistic—and fiercely ladylike—but she never discusses the heartbreak, the disappointment, the frustration she must have felt so often in her life. She lived in a time when one popular theory equated a person's intelligence to the size of his head. So she had to have encountered those who thought she was stupid, or slow. Plus the daunting physical limitations in an era of crude train travel, no elevators, etc. Her personal heartbreaks—and she had them--also were so determinedly glossed over. Trying to read between the lines, then, of her well-documented public life—exploring the woman behind the curtain, so to speak—that was my reason for writing the book. Can you explain why you decided to end the novel where you did—almost 40 years before Vinnie dies? Because I started to fear this would be a 500,000 word book if I went all the way to the end! She accomplished so very much in her lifetime—met every person of importance, went everywhere. The canvas of her life was simply so vast. But in every life, there are a thousand little stories, and it's up to the historical novelist to decide which scant handful of stories to tell—which ones can be weaved together into a compelling book. And the story that emerged, for me, was the story of her relationship with P.T. Barnum. It seemed to me he was the only person in her life with a personality as big as her own. So once that became clear, the rest of the novel took shape around this, and it made sense to end the book with their reconciliation; that was the story I wanted to tell. But there is quite a lot of story left; I may have to revisit Vinnie some day! As public a figure as she was, Vinnie was very private about her emotions and people close to her. Do you think she'd be pleased to see her name back in the headlines with your novel? While I'm not sure she'd like me pulling the curtain back on her private heartbreaks and frustrations, yes—I'm quite certain she'll be thrilled to see her name on the cover of a book again! As an historical novelist, are you more concerned with sticking to the absolute historical truth, or telling a good story? How did you balance the "fact versus fiction" aspect in this novel, and in Alice I Have Been? I like to say that I never let the truth get in the way of a good story! There's a reason why "A Novel" is on the front of the book. It's fiction, and I trust the readers to know that it is. Always, my hope is that, after reading one of my books, the reader is then inspired to learn more about these remarkable people. However, I do use the known facts as a template; they're the "bones" upon which I hang the "skin"—the story, the fiction. But sometimes you do have to take liberties—although I always try to take them with people whose motivations are truly unclear in the historical record. Or with events whose details remain unknown to us. I did the same with Alice I Have Been. Book clubs have really embraced Alice I Have Been. Do you think they will feel the same about this novel? 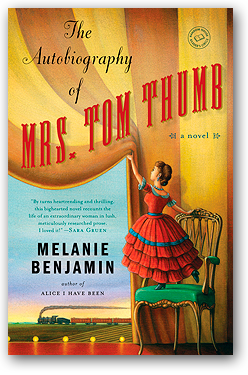 What themes will book clubs respond to in The Autobiography Of Mrs. Tom Thumb? I've been so fortunate with Alice I Have Been! I've met so many wonderful readers, and believe that talking with them has made me a better writer. I really do think book clubs will embrace The Autobiography Of Mrs. Tom Thumb. For one thing, Vinnie's story is played out against such a rich panoply of American history. There's so much to discuss and explore—the advent of the railroad, the Civil War, the Gilded Age. Then, too, there's a lot to discuss about a woman who so fiercely sought more than she ever should have expected, given her status as a single woman—not to mention a very small single woman!—in a time when a woman had no real choices in her life beyond marriage. Her size was her passport into a world she never would have seen, otherwise—but then, it also prevented her from living a traditional woman's life. And I sense she mourned that. You've talked about how there are many parallels between Vinnie's time and now—we may not have "curiosities" and "freak shows," but we live in a voyeuristic world and through technology (Twitter) and entertainment (reality television) have views into people's lives that are so very different than ours. Can you discuss this a little more here? Well, I'm quite certain that Vinnie would have her own reality show, were she alive today! She sought the spotlight so—in a way, she began to blur the line between real life, and the life people thought she was living, as depicted on stage and in Barnum's advertising. And I see that happening today—people who are famous simply for being famous, who then believe that they're talented, worthy of our attention for other reasons, as well. I think Vinnie probably fell into the same trap. And while we may decry a past in which people eagerly paid money to see "curiosities," or "freak shows," as they were eventually called—how are we any different today? We follow strangers on Twitter, we set our DVRs to record our favorite reality shows—some of which, to be truthful, are really no more than glorified versions of the "freak shows" of a different time. So nothing has really changed, has it? Well, as I'm certain my editor would not like me to spill the beans yet, all I can say is I'm working on another historical novel, this one set in the early part of the 20th century. And I'm trying to part the curtain on another famous person's fiercely private life. What do you read in your spare time, or when you're not writing? Everything! I'm an equal opportunity reader. I love non-fiction—histories, obviously! And literary and commercial fiction. Any good story, well told. I pretty much devote my weekends to reading, 2-3 books, if I'm lucky. I honestly believe that part of a writer's job is to read; it's how we learn, it's how we grow. After all, I never would have heard of Lavinia Warren Stratton had I not read E.L. Doctorow's Ragtime!